As an economically and socially advanced nation, the Netherlands is a low-lying nation, with a sophisticated agricultural sector and high population density. Half of the country lies below 1 meter above sea level, with an eighth of the country lying below sea level. Without an extensive network of dams, dykes and dunes, the Netherlands would be especially prone to flooding. As a predicted outcome of Global Climate Change, sea level rise could impact the Netherlands drastically, leading to social and economic devastation. The Zuyderzee Flood of 1916 was a defining moment in Dutch history. The Zuyderzeeworks, a series of dikes to reclaim this shallow inlet, was made in part due to the outcome of this flood. Although, this flood did cause 16 human causalities, substantial material damage instigated the reclamation of Zuyderzee from its shallow water. 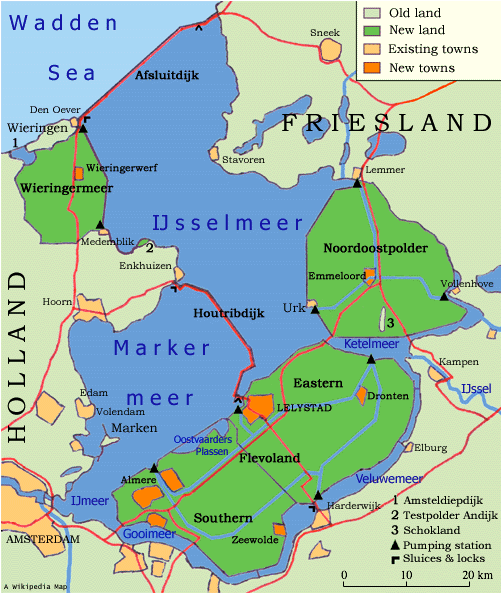 During the 1916 flood the island of Marken was completely engulfed with water and many levee breeches occurred near the town of Edam, which lead to the flooding of Waterland and Durgerdam. The Zuyderzeeworks designed by the Minister of Public Works, Ir. C. Lely, and approved by Queen Wilhelmina, began the reclamation of Zuyderzee. Minister Lely's plans included a large dike, the Afsluitdijk, which in turn allowed for further reclamation of the surrounding area. Unfortunately, further flooding occurred in 1953, with devastating consequences in loss of life, agricultural ability, and economic cost. The Flood of 1953 cost the lives of 1,835 people, ruined productive agricultural lands with the salts of seawater, and was costly to repair failed flood protection system. The Netherlands is well suited geographically and geologically to be a nation heavily involved in shipping. The nation is in the center of Europe with access to many rivers and bodies of water. 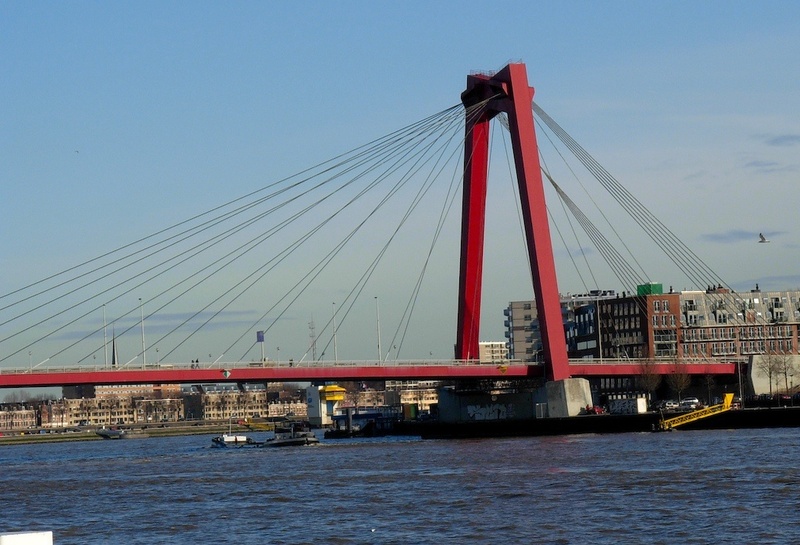 Rotterdam is Europe’s largest port city with access to the sea and several large rivers nearby (Rhine, Maas and Schelde), making it an important hub in the EU economy. The low-lying lands of the Netherlands are famous for several agricultural products. The towns of Gouda and Edam, as their names suggest, are very important to cheese production. The Netherlands supplies two-thirds of the world’s tulips, bulbs, and cut-flowers, helping the relatively small nation rank third in value of agricultural exports. For a small nation of 41,526 sq km, the Netherlands is densely populated with 486 persons per square kilometer. The threat of sea level rise due to Climate Change will test the country’s flood protection system. A breach of this system would be costly to repair, but would be even more devastating to the country’s economy and way-of-life. As its name suggests, the Netherlands, or ‘low countries,’ is and has been especially prone to flooding. Climate change has the potential to increase sea levels by 20 feet (6.1 m). The lowest city within the Netherlands lies 7 meters (23 ft.) below sea level, much lower than New Orlean's 9th Ward. The expansive system of dams, dykes, and dunes maintained by the country, may not be able to hold back the flood of Climate Change. The Netherlands is often associated with peaceful rows of spring tulips, sharp and buttery cheeses, and windmills turning in the breeze. Yet, these popular associations with Dutch culture would not be possible without protection from the unpredictable North Sea. The North Sea is stronger and more unpredictable than the three Dutch rivers that flow through the country. Flood protection from the North sea is mandated to have a 1-in-10,000 years protection (a failure in the flood protection system would only occur once in 10,000 years). Without this level of protection, agricultural lands would often be inundated with floodwater. 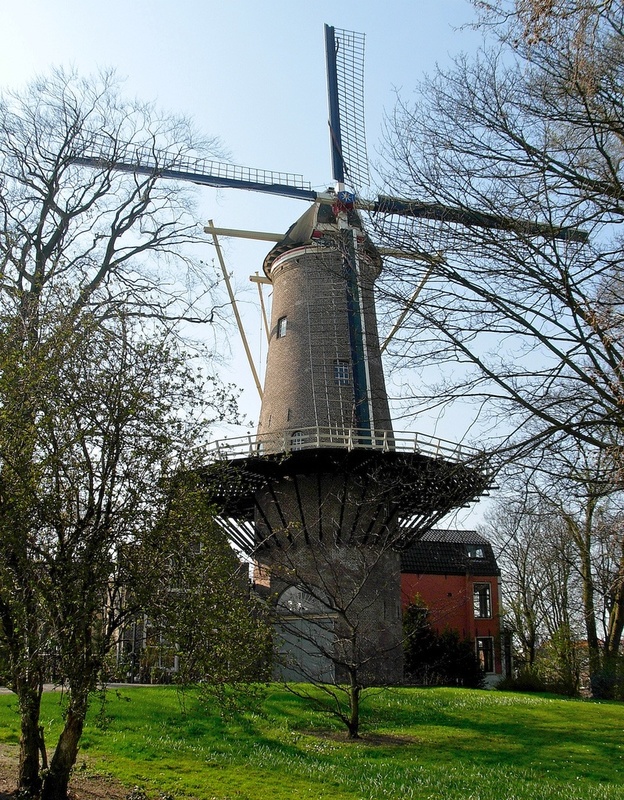 In most cases agricultural and pasture land lies on ‘polders,’ or land reclaimed from the sea, and the iconic windmills of the Netherlands were built to pump excess water off of agricultural soils. With 41,526 sq kilometers, the Netherlands supports a population of just under 16.5 million people, making it one of the most densely populated countries in the world. If flooding occurs on a mass scale many people will be displaced from their homes and workplaces. Rising sea levels could wreak havoc on the Dutch way of life. The people, economy, and land itself, would be swept away, costing the Dutch their livelihood and possibly their lives. It is impossible to know when or if flooding will strike the Netherlands. The IPCC predicts that there will likely be increased incidence of extreme high sea level events in the 21st century. Global warming has caused the Earth’s polar regions to be much warmer for longer periods of time. Melting glaciers and polar ice caps 125,000 years ago increased sea levels by 4 to 6 meters. Changes in climate and weather patterns will exacerbate the already rising sea level. Storm events over the North Sea are often powerful and unpredictable. Although the Netherlands does not experience hurricanes, similarly strong events could cause major damage and loss-of-life. New Orleans, like most of the Netherlands, lies below sea level and posses a series of flood control mechanisms. Unfortunately, New Orleans sustained a direct hit from one of the worst hurricanes in U.S. history. Hurricane Katrina caused 1,833 fatalities over five states, and resulted in a total economic loss of 81 billion dollars. Over 1.2 million people in the area were under an evacuation order. Evacuation efforts were slow and resulted in long back-ups on area interstates. Although New Orleans is heavily populated, the Netherlands population density is higher over a larger area. Most people rely on public transport to get around town and surrounding areas. Evacuation efforts in the Netherlands would have to be well planned and executed to avoid the difficulties that were seen during Hurricane Katrina in the United States. Hurricane Katrina impacted several U.S. states directly with flooding and storm surges, but also indirectly through migration and long-term economic damage. 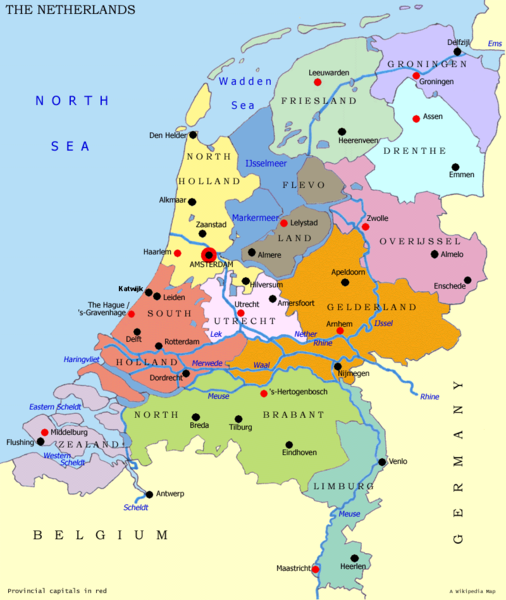 The Netherlands is only roughly equal to the size of twice New Jersey. If flooding should occur on a vast scale, it can be inferred that such an event would be extremely costly. Numerous lives could be lost. The Netherlands’s land area, an important resource for its aricultural economy, could be washed away. This type of event could threaten the long-term health of the Dutch people, economy, and government. Flooding on any large scale would cause evacuation and possible permanent displacement of the people living in the Netherlands. Higher socioeconomic classes are often able to adjust to environmental problems, because they can afford residence in areas with clean air, clear water, and lower chance of flooding. The aftermath of Hurricane Katrina illuminated the numerous environmental justice issues residents of the lower-ninth ward endured. Undoubtedly, similar issues will face the residents of the Netherlands. A Dutch Ministry of Water Management advisor has noted, “society must recognize that there will be losers from adaptation, and they must be compensated” (Hertsgaard, 2007). In recent years Europe has seen an influx of immigrant populations from Africa and the Middle East. Some of these immigrants are Islamic and face cultural differences and discrimination. Many European countries have sought to ease the religious and political tension between differing cultures by implementing policies. Controversially, governments have sought out ways to integrate Islamic culture into traditional European society. France most notably banned schoolgirls from wearing headscarves in at the start of the school year in 2004, as adult women in France’s public sector were already forbidden to wear such “overt’ religious symbols. For comparison, a ban on headscarves for schoolchildren is also in effect in Turkey. But, other countries like Great Britain and the Netherlands allow headscarves in public schools. The Netherlands also subsidizes many mosques and Islamic schools throughout the country. Yet, public support for Islamic institutions is the Netherlands is controversial. The contrast between the Dutch and Muslim cultures has lead to public conflict. Pim Fortuyn, ran for public office after a series of Muslim attacks on openly gay couples. Openly gay himself, Mr. Fortuyn was elected in 2001 for office in Rotterdam, even though he labeled Islam a “backward” religion. His platform included limiting immigration quotas for Muslim individuals. In May of 2002, Volkert van der Graaf assassinated Mr. Fortuyn for his controversial political comments. Pim Fortuyn’s assignation was the Netherlands’s first politically motivated murder in 300 years. 5.5 percent of the Dutch population is Muslim. Disproportionately however, Muslim women represent more than half the women in shelters seeking refuge from domestic disputes. Ayaan Hirsi Ali is a famous Dutch, Muslim, feminist who has focused attention on the treatment of Muslim women in the Netherlands and around the world. She has called on Muslim women in the Netherlands to claim equal rights in Dutch society, as the law allows. Hirsi Ali argues that Many Dutch Muslim women do live in segregated "parallel cities" where Islamic social codes are enforced. Often domestic disputes are not handled under Dutch law. She believes that Dutch officials and police have often turned a blind-eye the treatment of Muslim women in the Netherlands. Ayaan Hirsi Ali was a member of the house of Dutch parliament. She also collaborated with Dutch filmmaker, Theo Van Gogh, on the film, Submission. Submission depicted discriminatory practices toward Muslim women. in the Islamic region. On November 2, 2004 Mohammed Bouyeri, upset with the film, brutally murdered Theo Van Gogh and threatened the life of Hirsi Ali. Van Gogh’s murder made international headlines and focused the world’s attention on European-Muslim conflict. Sea level rise could be drastic and sudden or slow and gradual. The IPCC predicts an number of outcomes, based on the global community’s response to Climate Change. The best outcome for lowering sea level rise would be a drastic cut in greenhouse gas emissions. However, even under the best case scenario, the sea level will rise by about 0.4 meters at the turn of the century. North Sea storms could worsen, and further threaten the Netherlands. The IPCC further predicts that long-term climatic patterns around the world will change. It is difficult to predict how the specific climate of the Netherlands will be impacted by climate change. The government of the Netherlands has recognized the threat of sea level rise and climate change. Current proposals in Dutch parliament call for upgrades in flood protection. If this proposal passes North Sea flood protection will be upgraded to 1-in-100,000 years status. Such a large commitment is part of the Netherlands’s “Living with Water/We are Here to Stay” campaign. This upgrade will be a costly and time-consuming project. It is estimated that this plan will cost 0.2% of the Netherlands yearly GDP to build and maintain. As a flat, low-lying country near the sea, the Netherlands’s temperature is fairly consistent and does not change drastically. Because of its proximity to open water and flat terrain, the sky is often cloudy and the wind is strong. 13 mph winds are the average, which the country utilizes for wind turbine generated power and traditional windmills use to pump water. Summers are cool and winters are not extreme. Severe weather events occasionally occur when high pressure areas over the Azores and low pressure areas centered around Iceland meet around the Netherlands. Global climate change will increase sea level and cause drastic changes in climatic weather patterns. Half of the Netherlands lies below sea level. Currently, these areas face the most serious threat of flooding. Presumably as sea levels rise, more areas will become below sea level, and face the same threat form flooding. Sea level rise combined with the potential for even more powerful North Sea storms could to impact the entire nation. Migration from such an event would affect the surrounding region. Loss of lives from Hurricane Katrina totaled 1,833. If a drastic flooding event were to occur, many more lives could be lost in the Netherlands. 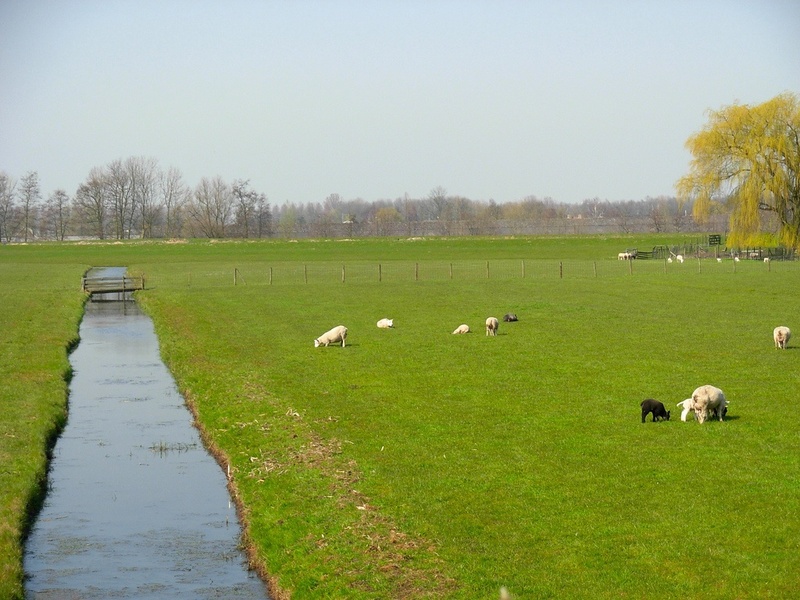 Future environmental conditions will directly impact the Netherlands land mass. Its people, economy, and government will have to adapt to rising sea levels, by building higher dams and dykes. Directly, people will have to relocate at least until the waters recede. Migration of individuals could turn into a long-term issue if flood control technologies cannot keep up with climate change. Often, low lying areas are important modes of production in agricultural productivity. In the short-term crops could be lost, causing temporary economic shocks. Yet, larger flood events could cause substantial damage to agricultural infrastructure (rail, shipping lanes and ports, and processing facilities) important in delivering those goods to the proper markets, undiminished. No more than 2% of the Netherlands’s population is devoted to agricultural production. Yet, this country produces a large surplus in food-products for the surrounding region. Rising sea levels could prove too difficult to handle, along with changing climate and weather patterns. The government may plan and implement the most advanced system of flood protection. Yet, the government and climate scientists cannot predict the future climate of the Netherlands. If flooding should occur, land will become scarce. Scarcity increases price and indirectly causes conflict between differing demographics in the Netherlands and surrounding countries. After a flood event, higher socioeconomic classes will be able to maintain a lifestyle that closely resembles the one they had prior to the event. Some Dutch citizens may also choose to move to other areas, further spreading land scarcity to other countries. As the Netherlands is a large shipping hub, ports and the transport of consumer goods will change with a large flood event. The high storm surges and receding waters of Hurricane Katrina changed shipping lanes and damaged equipment dedicated to the safe passage of ships in the Mississippi river and Gulf of Mexico. If a similiar extreme weather event were to flood the Netherlands, a devastating disaster could occur. 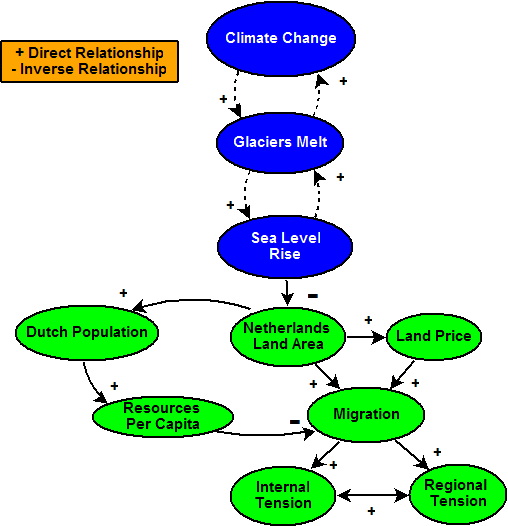 A causal loop diagram relating the possible future outcome of a climatic flooding event on the Netherlands. Climate change causes sea levels to rise while also affecting traditional patterns and strengths of storm events. A large flood would decrease the land area of the Netherlands which will effect its ability to directly (housing, employment, agricultural goods) and indirectly (scarcity leads to higher prices and more competition) support its population. Scarcity of land in the Netherlands will cause internal and regional tension as housing prices in the surrounding areas would be expected to increase. 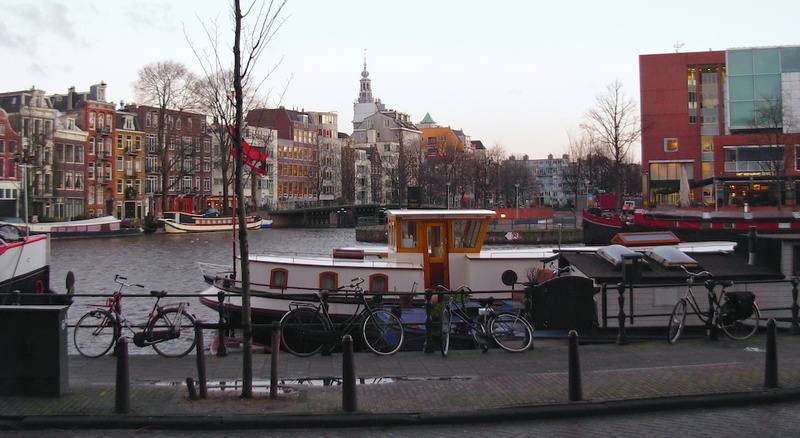 Policymakers within the Netherlands are addressing climate change with plans to heighten flood protection efforts throughout the country. They have asserted that, “We are here to Stay,” by committing their time and financial resources to the “Living with Water” strategy. BBC News. Q&A: Muslim Headscarves. Posted August 31, 2004. Access date: 10 April 2007. < http://news.bbc.co.uk/1/hi/world/europe/3328277.stm>. Britannica Encyclopedia: The Netherlands Climate. Access date: 10 April 2007. <http://www.britannica.com/eb/article-35861/The-Netherlands>. The CIA World Factbook: The Netherlands. Access date: 27 January 2007. <https://www.cia.gov/cia/publications/factbook/geos/nl.html>. Climate Crisis: What is Global Warming? Access date: 27 January 2007. <http://www.climatecrisis.net/thescience/>. Deltawerken Online: Floods. Access date: 27 January 2007. <http://www.deltawerken.com/Floods/22.html>. Encarta Encyclopedia: The Netherlands. Access date: 27 January 2007. <http://encarta.msn.com/encyclopedia_761572410/Netherlands.html>. Hertsgaard, Mark. (2007). On the Front Lines of Climate Change, Time, April 9, 2007. The Nation. The Dutch Muslim Culture War. Posted June 9, 2005. Access date: 10 April 2007. <http://www.thenation.com/docprem.mhtml?i=20050 627&s=scroggins>. National Hurricane Center. Tropical Cyclone Report: Hurricane Katrina. Published Decemeber, 20, 2005. Access date: 10 April 2007. <http://www.nhc.noaa.gov/pdf/TCR-AL122005_Katrina.pdf>. National Public Radio. Dutch-Muslim View of Europe’s Future. Talk of the Nation, Aired May 5, 2005. Access date: 10 April 2007. <http://www.npr.org/templates/story/story.php?storyId=4632123>. "Willems Bridge," "Dutch Farm," "Gouda Windmill," and "Amsterdam Canal" with permission from photographer, Nicholas McKinney. <http://www.flickr.com/photos/nickmckinney/>.